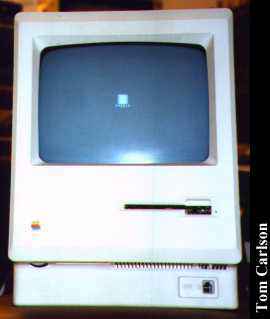 The first Macs had only 128k RAM and used single-sided, 400k floppy drives. The signatures of the original Mac designers are molded into the inside back of the case. One entertaining aspect of this is the placement of the names of Jobs and Woz. Jobs signed his name nice and big smack dab in the center of the case. Off in the lower right hand corner is a little scribbled "Woz." However, in the actual stamped case, there is a thickened strip running down the center, presumably to provide stiffness. This strip partially obscures Steve's name, while the little Woz in the corner remains unscathed. I find this delightfully ironic. This little Mac 128k is not running right now. One of the RAM chips has failed. My plan is to desolder it, then put a socket in its place. Then I can try different RAM chips I have laying around. 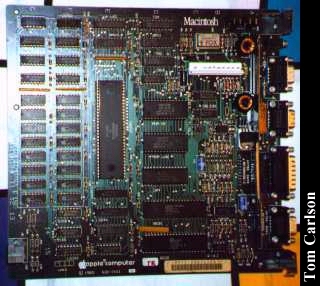 I'm not sure, but I believe that you can convert a Mac 128k into a Mac 512k by simply replacing the RAM chips with higher capacity chips. 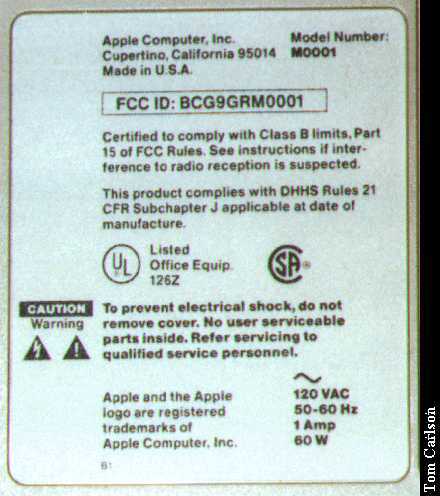 Close-up of the badge on an original Mac 128k. If it actually says "128k", it's not an original. Close-up of label on back side. 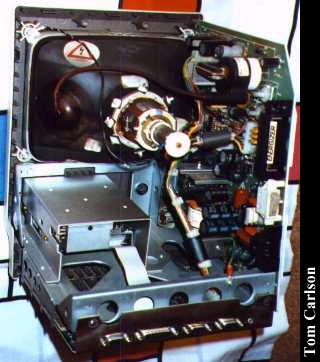 Guts of a Mac 128 - Not a pretty sight, but still not as crowded as a Mac SE. Click here to view all comments for the Apple Macintosh 128K and to leave your own. Click here to view comments about other Apple computers.